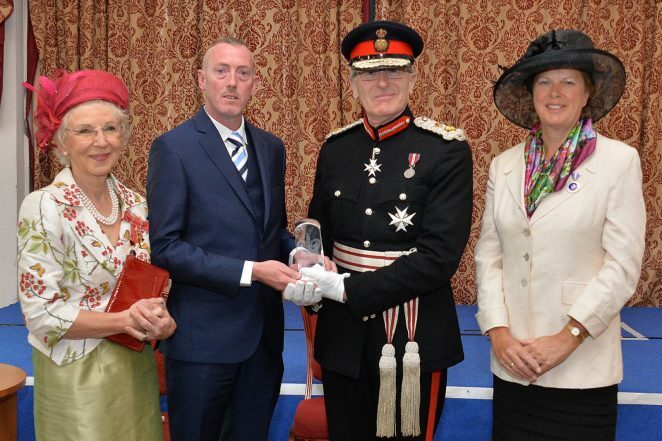 Our photograph shows the Lord Lieutenant of East Sussex Peter Field presenting Danny Dwyer from Bear-Patrol with the Queens Award for Voluntary Service. Also present in the group are Deputy Lieutenants of West Sussex Mrs Margaret Bamford (left) and Mrs Caroline Nicholls (right). This award is the highest honour a voluntary group can receive and is intended to mark and celebrate their outstanding contribution to their community. Bear Patrol, founded in May 2008 by Danny Dwyer, is a LGBT social group who provide a network for their local community, and organise leisure and fundraising events intended to address and reduce social isolation. Their aims are to enable individuals to meet friends and new faces in a happy environment, free from attitude and stigma. My Brighton and Hove would like to add their congratulations – well done all!